Eagle Wright offers extensive knowledge in what the textile needs are for your products; Care labels and Feature/Brand labels available printed and woven in many price points. Heat Transfers, Woven Labels and Printed Labels, are offered on rolls or as singles – from hand applied to automated equipment. Eagle Wright is now providing Fabric Label Printing Systems for the textile industry. Brand identification to embellish textiles and apparel. From linens and home furnishings, apparel to tents and mop heads, there are labels and tags needed to properly display logos and information about a product including price, lot number, or size. 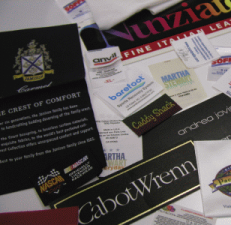 Woven and printed fabric labels for neck or waistband, for care and content. Brand image should carry through to the last detail, including the hang tag. Size strips and other stickers for the temporary outside information about the product. Don’t forget the printed and woven trims for collars, hem lines, sleeves, luggage, even dog leashes and matching dog collars. Specialists to offer ideas on a unique approach to your brand or data carrying trim. Eagle Wright monitors regulations that affect many industries including CPSIA compliant tracking labels for children’s products. Tracking information is required for products marketed to and used by children under 12 years of age. Eagle Wright offers a Quick Print solution for fast turn on any size order. We are a leading supplier of fabrics and fabric care ribbons used with many table top printers. Make your own tracking labels, care content labels and price tickets or sizing information with one of our Printer offerings matched to the right material. Eagle Wright has all the components available for you to print your own textile labels. 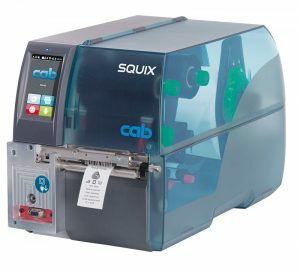 At our one stop shop you can purchase our SquixMT Printer, Nylon Material, Fabric Care Ribbons bundled together creating our unique Thermal Transfer Fabric Label Printing System. We also offer thermal transfer printable Nylon fabric material and fabric care ribbons as a kit or you can purchase separately. Eagle Wright has many different types of thermal transfer printable fabric materials ask one of our experts for a quote.